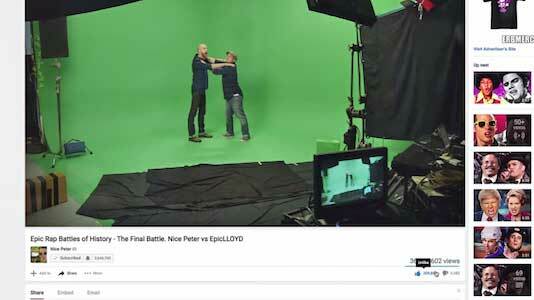 Nice Peter and EpicLLOYD have been producing new episodes of the popular Youtube series Epic Rap Battles of History for near seven years, amounting to 70 episodes total. Through hard work and dedication, they’ve turned their battles into one of the most popular shows on Youtube, and have toured across the country performing them at sold out shows. They’ve covered everyone from Cleopatra to the Teenage Mutant Ninja Turtles, from Genghis Khan to the Mythbusters, from Beethoven to the Mario Brothers, and everything in between. However, creative fatigue can catch up with everybody. The last episode of ERB went up almost a year ago, and pitted Peter and Lloyd up against each other in a rematch of the original Season 1 finale. Will this actually be the final battle, or will this be a turning point for the series and the two men behind it? 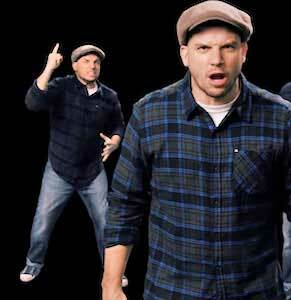 EpicLLOYD wears navy blue chucks in the sequel to his battle with Nice Peter. The video begins with Peter and Lloyd sitting at a desk, editing an episode of ERB. They get into an argument about the process, when Pete suddenly burst into the battle saying that he is burnt out from dealing with Lloyd everyday for the past six years. He starts going off on all the things that bug him about Lloyd like his low brow jokes and his habit of fighting with Pete on everything. Lloyd then comes back stating that he argues with Pete cause he’s too stubborn to admit not all of his ideas are good, and that his process takes way too long and forces everyone else to sit around and wait for him. We see in these shot that Lloyd is wearing navy blue chucks. This battle is vastly different from their first encounter, as that was more about who’s better and this one is more about their own faults as producers of the show. You can tell that the barbs are real frustrations the two have with each other and the production of the series, but that they are dialed up to eleven for the sake of comedy. It never gets too heated which makes the jabs very funny and ok to laugh at. Lloyd is fed up with Pete’s ego. The video ends with Pete and Lloyd apologizing to each other and the editors, who then finish editing the video and recording the song. They decide solve their issues by doing what they do best: make music. The backgrounds in the video also offer a nice nod to the 70 battles as they feature previously used backgrounds from Pete and Lloyd’s characters. After this video was released, many fans feared that it was the series finale, and that fear was bolstered by the fact that no new battles have been uploaded in the year since. However, a recent update video from Lloyd and Pete confirmed that this was merely a much needed break and that the battles will be back soon. So while this feud between two friends wasn’t the end of the beloved series, it does mark a turning point and a chance for the battles to become new again. Peter and Lloyd quickly realize that this isn’t a good idea. Click on the links below to get a new pair of chucks to wear at an epic rap battle.